•A thermistor bolometer with a 14- to 16-fim optical passband was used for SIRIO. yielding a pulse which is identified by the sensor electronics. The sensor discriminates between Sun and Earth or Moon pulses and measures the time differences, or rotation angles, between transits of the Sun and Earth by each slit as illustrated in Fig. 6-31. COS-B and 1SEE-2 did not fly separate Sun angle sensors, because the Sun angle can be computed from the time difference between the Sun transit of the meridian and inclined slits, as described in Section 7.1. The primary advantage of the ASU is that wide angle coverage can be obtained by a single sensor with no moving parts and no complex commanding logic as is required for the PAS. 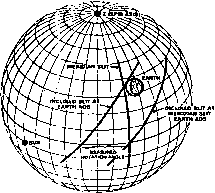 In addition, a single ASU provides Sun angle, nadir angle, and multiple Sun/Earth rotation angle measurements. However, the ASU has a lower sensitivity to the Earth and the Moon and more complex signal processing electronics than does the PAS. Section 22.1 contains a further discussion of the relative advantages of slit sensors and other sensor types. versatility. These systems operate over a narrow range of orbits and attitudes and include moving and static edge trackers and radiometric balance systems. 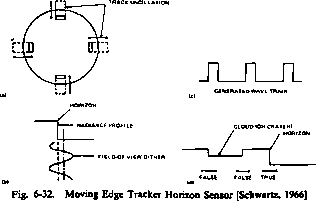 The moving edge tracker, illustrated in Fig. 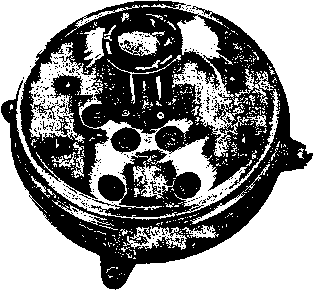 6-32, has been used on OGO and Gemini. Four oscillating detectors dither across the horizon edge and generate a train of nearly rectangular pulses, as shown in Fig. 6-32(b) and (c). The spacing and width of the pulses vary depending on the null error or the position of-the detector relative to the horizon. As will be shown in Section 6.3, the second harmonic of the detector output is related to the null error. The moving edge tracker uses a feedback system to null the second harmonic or attitude error. For earth trackers, irregularities in the atmosphere composition or temperature can generate false structure, as shown in Fig. 6-32(d), and an erroneous second harmonic in the tracker output [Schwartz, 1966]. The Gemini V-edge trackers experienced track loss at sunrise and sunset [Hatcher, 1967]. The static Earth sensor flown on Symphonie at synchronous altitude used an array of thermopiles configured as shown in Fig. 6-33(a) [Ebel, 1975]. The difference in the output between opposite thermopiles provided a measure of the attitude error. Eight thermopiles, rather than four, were used to provide redundancy and Sun discrimination. Radiometric balance systems, illustrated in Fig. 6-33(b), are similar to the static edge tracker except that a wide field-of-view sensor is employed. Such systems work well if the target radiance is uniform. An accurate radiometric balance sensor, manufactured by Quantic, is used on ERTS/LAND-SAT to provide 0.1-deg accuracy [General Electric Space Systems, 1971].